When you want a classic look for your kitchen or bath remodel, choose our Java Shaker Deluxe RTA kitchen cabinets from RTA Kitchen Cabinets Online. Our Java Shaker Deluxe full overlay door style cabinets are sure to please with our superior finish and quality. Our Java Shaker Deluxe RTA kitchen cabinets are built with traditional craftsmanship to ensure a high-end product that's designed to stand the test of time. Face Frame: 1.5" wide x 3/4" Thick Solid Hardwood Stained To Match Doors & Drawer Fronts. Box material: 1/2" Maple cabinet grade plywood. Back: 1/2" plywood back with 1/2" plywood hanging rails. Construction: I-beam construction using brad nails and wood glue. All frames, sides and back panels have pre-cut dadoes for seamless construction. This method is used by almost all custom cabinet makers. Shop For RTA Java Shaker Cabinets Today! Shop For Pre-Assembled Java Shaker Cabinets Today! At Online Cabinets Direct, we have earned a name for ourselves in the industry by offering the best in cabinetry for less. From our Tennessee headquarters, we have been serving customers all over America and beyond for years with the finest in cabinetry. 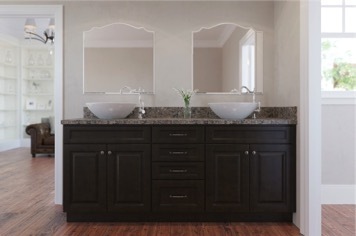 When you buy kitchen cabinets or bathroom vanities from us, you can count on receiving exceptional quality and value. We don't believe in cutting corners to produce our products, so you can buy cabinets online with confidence. Our full overlay shaker door styling cabinets offer simple elegance in a classic design. We go to great lengths to ensure that these RTA kitchen cabinets are crafted with care. Their specifications speak for themselves.